Falls, with or without injury, also carry a heavy quality of life impact. A growing number of older adults, fear falling and, as a result, limit their activities and social engagements. This can result in further physical decline, depression, social isolation, and feelings of helplessness. It is obviously important to discover methods to improve balance and decrease the number of falls in the elderly. Yoga practice helps to develop strength, flexibility, and balance. It would seem likely, then, that practicing yoga would reduce the likelihood of falling by the elderly. They found that there were no adverse events and no falls reported during the program. After the 3-month yoga program the elderly participants were significantly faster in the sit-stand test, had increased stride length while walking, and significantly lower body weight and fear of falling. Hence, participation in a yoga program improved the physical abilities of the elderly. It should be noted that there wasn’t a control or comparison condition so conclusions should be reached cautiously. The results suggest that practicing yoga is beneficial for elderly men and women. These results are sufficiently encouraging to support conducting a large randomized controlled trial. The participants in the present study were quite healthy at the beginning of the trail, so ceiling effects may have prevented the detection of further benefits. Indeed, the participants all successfully passed the most difficult balance test during the baseline test, leaving no room for improvement, In a future trial, it would be good to include participants whose health and physical abilities weren’t quite as good. Regardless, the results suggest that yoga practice is beneficial for the elderly. So, reduce fear of falling in the elderly with yoga. Falls are an emerging public health issue in India, with the impact set to rise as the population ages. 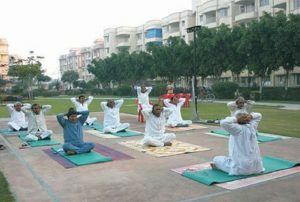 We sought to evaluate the acceptability, feasibility and likely impact of a yoga-based program aimed at improving balance and mobility for older residents in urban India. Fifty local residents aged 60 years and older were recruited from urban Hyderabad, Andhra Pradesh. They were invited to attend a 1-h yoga class, twice weekly for 3 months. Mixed methods were used to evaluate the acceptability and feasibility (qualitative) and likely impact (quantitative). Two focus groups and eight interviews with participants were conducted to evaluate the acceptability and feasibility of a yoga program. Thematic analysis was conducted in context of perceptions, barriers and benefits of yoga participation and fall ascertainment. Physical performance using the Short Physical Performance Battery, fear of falling, blood pressure and weight loss were measured before and after the program. The interviews and focus groups provided insights into the preferred format for classes, including session times, level of supervision and location. Improvements were seen in the Short Falls Efficacy Scale-International (Short FES-I (15.9 ± 4.0 vs 13.8 ± 2.1 s, p = 0.002)), the number of steps taken in the timed 4-m walk (T4MW (9.0 ± 1.8 vs 8.6 ± 1.8, p = 0.04)), Short FES-I scores (9.4 ± 2.9 vs 8.6 ± 2.9, p = 0.02) and weight (63.8 ± 12.4 vs 62.1 ± 11.6, p = 0.004) were lower. No changes were seen in standing balance, blood pressure or T4MW time. Yoga was well accepted and resulted in improved ability to rise from a chair, weight loss, increased step length and reduced fear of falling. These results provide impetus for further research evaluating yoga as a fall prevention strategy in India. Falls, with or without injury, also carry a heavy quality of life impact. A growing number of older adults, fear falling and, as a result, limit their activities and social engagements. This can result in further physical decline, depression, social isolation, and feelings of helplessness. It is obviously important to discover methods to improve balance and decrease the number of fall in the elderly. Tai Chi training is designed to enhance and regulate the functional activities of the body through regulated breathing, mindful concentration, and gentle movements. It includes balance training and has been shown to improve balance and coordination. These studies, however, employ Tai Chi training over long time frames of 6 months to a year. It is not known if shorter term training would also be effective. In today’s Research News article “Effects of 12 Weeks of Tai Chi Chuan Training on Balance and Functional Fitness in Older Japanese Adults.” (See summary below or view the full text of the study at: https://www.ncbi.nlm.nih.gov/pmc/articles/PMC5968980/ ), Takeshima and colleagues recruited older adults averaging 73 years of age and assigned them to either receive 12 weeks of Tai Chi training for 2 days per week for 60 minutes or to a no-treatment control group. They were measured before and after training for static balance, dynamic balance, and functional fitness, including upper and lower body strength, balance and agility, upper and lower body flexibility, and cardiorespiratory fitness. Contrary to longer-term studies, they did not find any significant differences between the Tai Chi training and no-treatment control groups in static balance, dynamic balance, or functional fitness. This lack of benefit of Tai Chi training may well be due to the relative shortness of the 12-week program relative to previous studies employing 6-month to one year trainings. Indeed, previous research by Holmes and colleagues also employing a 12 week program could not detect any overall improvement in balance, but could detect a subtle improvement in postural-respiratory coupling. This may be a precursor to improvements in overall balance. So, 12-weeks of training may produce subtle changes that, if continued over a longer period of time, will lead to improvements in balance. Tai Chi movement patterns can be fairly complex and the elderly may have difficulty learning them over a few sessions. Indeed, it has been reported that it takes 8 to 16 sessions before the patterns are mastered. So, there may need for longer periods of training to master the technique and benefit from it. Hence, there is a need for further research on the amount of Tai Chi training needed to improve balance and reduce falls in the elderly. The purpose of this study was to determine the effects of Tai Chi Chuan on static and dynamic balance, and functional fitness in older adults. Forty-nine volunteers were divided into an exercise group (EX: 9 men and 16 women, average age 72 ± 5 years) and control group (13 men and 11 women, average age 73 ± 6 years). The EX participated in a 12-week supervised exercise program (60 min/day, 2 days/week) that consisted of 10-min warm-up and stretching, 40-min Tai Chi Chuan exercise (long-form Yang style with 108 movements), and 10-min cool-down/relaxation exercises. The control group was asked to not change their physical activity habits. Static (sway velocity standing on firm or foam surfaces with eyes open or closed) and dynamic balance (limits of stability (LOS)), as well as functional fitness measures of body mass; upper- and lower-body strength; and flexibility, mobility, and aerobic fitness were taken before and after the intervention. After the 12-week Tai Chi Chuan exercise program, there were no improvements in any functional fitness or balance variable although components of LOS tended to increase (13.1%, p = 0.052). These results indicate that 12 weeks of Tai Chi Chuan exercise has no significant effect on balance and functional fitness parameters in older Japanese adults. The process of aging affects every aspect of the physical and cognitive domains. Every system in the body deteriorates including motor function with a decline in strength, flexibility, and balance. Impaired balance is a particular problem as it can lead to falls. In the U.S. one third of people over 65 fall each year and 2.5 million are treated in emergency rooms for injuries produced by falls. 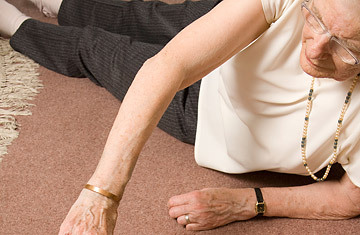 About 1% of falls result in deaths making it the leading cause of death due to injury among the elderly. Falls, with or without injury, also carry a heavy quality of life impact. A growing number of older adults, fear falling and, as a result, limit their activities and social engagements. This can result in further physical decline, depression, social isolation, and feelings of helplessness. It is obviously important to discover methods to improve balance and decrease the number of fall in the elderly. An interesting contributor to imbalance is the synchronization of respiration with postural sway. When a person stands erect, with eyes closed, there is a normal sway in the posture. When respiration occurs the expansion of the abdomen and chest produces a slight shift in the center of gravity and the body sways to compensate. When the normal sway becomes synchronized with the sway produced by respiration, it results in an exaggeration of the sway. This produces a greater imbalance. This is usually minor and of very little consequence. But, in the elderly, with compromised balance and muscular control, the small extra imbalance may be a contributor to falls. Tai Chi training is designed to enhance and regulate the functional activities of the body through regulated breathing, mindful concentration, and gentle movements. It includes balance training and has been shown to improve balance and coordination. Indeed, Tai Chi training has been shown to reduce the likelihood of falls in the elderly. One possible way that Tai Chi training may contribute to the decrease in falls is by decreasing posturo-respiratory synchronization. This interesting speculation has not been previously investigated. Holmes and colleagues investigate the effect of Tai Chi training on posturo-respiratory synchronization. They recruited healthy males and females over 70 years of age and randomly assigned them to receive either Tai Chi training or education. Tai Chi training consisted of 12 weeks of instructor led group training for one hour, twice a week. The education condition involved health related lectures on the same schedule as the Tai Chi training. Before and after training the elderly were measured for postural sway, respiration and posturo-respiratory synchronization. They found that after training neither group showed a change in postural sway or in respiration. Although the two groups did not differ in posturo-respiratory synchronization before training, after training the Tai Chi had significantly smaller posturo-respiratory synchronization than they did during baseline and in comparison to the education group. Hence, Tai Chi training reduced the contribution of posturo-respiratory synchronization to imbalance in the elderly. This may be one of the mechanisms by which Tai Chi training improves balance and reduces falls in the elderly. Falls become more and more likely with age and the consequences of falls to the elderly can be devastating. So, a practice that can lower the risk of falls is important for the health and well-being of the elderly. Tai Chi is not strenuous, involves slow gentle movements, and is safe, having no appreciable side effects. So, it is well suited as an exercise for an elderly population. In addition, once learned it can be practiced at home or in groups, making it a flexible very low cost solution. Hence, it appears that Tai Chi should be recommended to the elderly to improve balance and reduce falls and thereby improve the health and well-being of the elderly. So, improve balance in the elderly by uncoupling posture and respiration with tai chi. In order to maintain stable upright stance, the postural control system must account for the continuous perturbations to the body’s center-of-mass including those caused by spontaneous respiration. Both aging and disease increase “posturo-respiratory synchronization;” which reflects the degree to which respiration affects postural sway fluctuations over time. Tai Chi training emphasizes the coordination of respiration and bodily movements and may therefore optimize the functional interaction between these two systems. 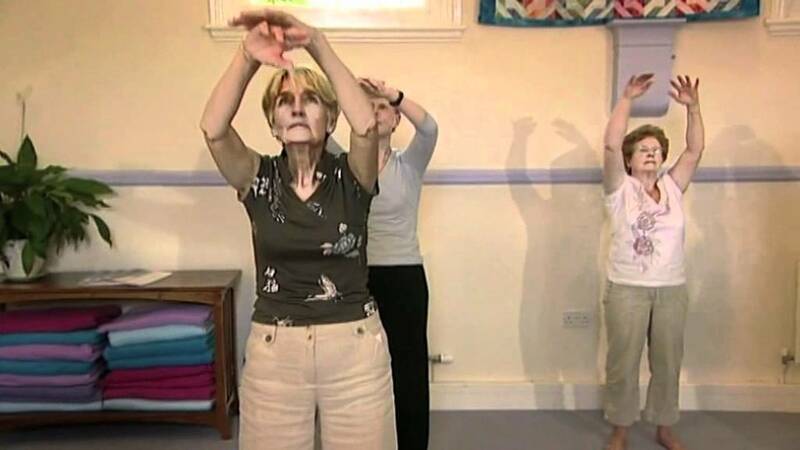 The purpose of the project was to examine the effect of Tai Chi training on the interaction between respiration and postural control in older adults. We hypothesized that Tai Chi training would improve the ability of the postural control system to compensate for respiratory perturbations and thus, reduce posturo-respiratory synchronization. 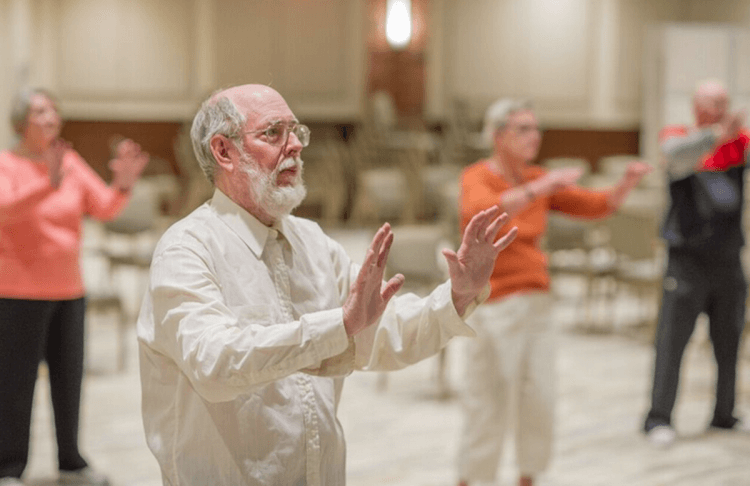 Participants were recruited from supportive housing facilities and randomized to a 12-week Tai Chi intervention (n=28; 86±5yrs) or educational-control program (n=34, 85±6yrs). 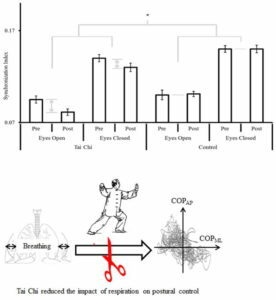 Standing postural sway and respiration were simultaneously recorded with a force plate and respiratory belt under eyes-open and eyes-closed conditions. Posturo-respiratory synchronization was determined by quantifying the variation of the phase relationship between the dominant oscillatory mode of respiration and corresponding oscillations within postural sway. Groups were similar in age, gender distribution, height, body mass, and intervention compliance. Neither intervention altered average sway speed, sway magnitude or respiratory rate. 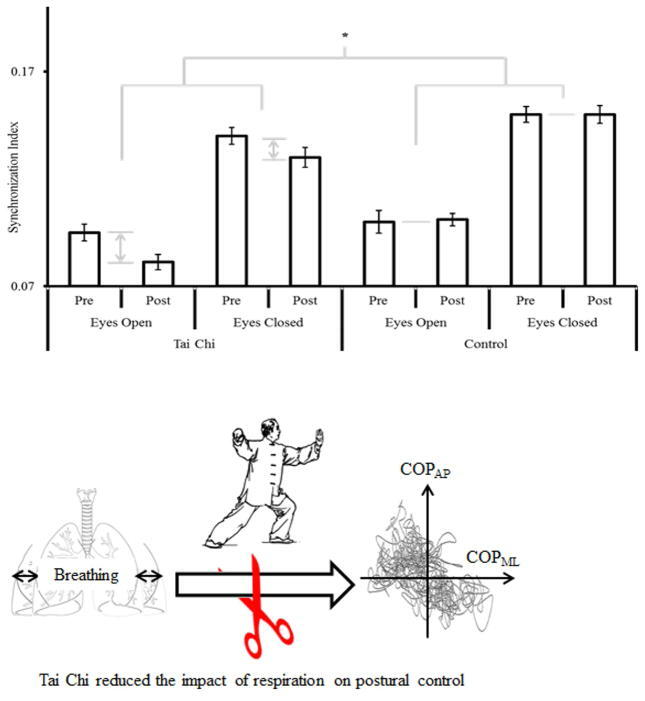 As compared to the education-control group, however, Tai Chi training reduced posturo-respiratory synchronization when standing with eyes open or closed (p<0.001). Tai Chi training did not affect traditional parameters of standing postural control or respiration, yet reduced the coupling between respiration and postural control. The beneficial effects of Tai Chi training may therefore stem in part from optimization of this multi-system interaction. Huang and colleagues reviewed and summarized the published research findings on the effectiveness of Tai Chi practice in preventing falls in the elderly. They identified 18 research publications describing randomized controlled trials, 16 of which were included in a meta-analysis. The studies included employed Tai Chi practice with individuals over 60 years of age and measured falls. They found that the published research indicated that with Tai Chi training there were more elderly individuals who did not experience any falls at all and of those who did fell less often. These improvements were associated with the frequency of training with the greater the training the greater the benefits. In addition, the style of Tai Chi mattered with the Yang style being superior to the Sun style in preventing falls. The Yang style Tai Chi is characterized by big and open movements and is the most popular form of tai chi studied today. Sun Style has movements that are continuous, slow, even and with agile steps, a higher stance, and less kicking and punching. So, it would appear that the large and open movements of the Yang style are important in improving balance and thereby making falls less likely. These are important findings. 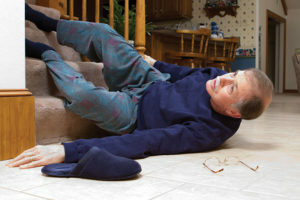 Falls become more and more likely with age and the consequences of falls to the elderly can be devastating. So, a practice that can lower the risk of falls is important for the health and well-being of the elderly. Tai Chi is not strenuous, involves slow gentle movements, and is safe, having no appreciable side effects. So, it is well suited as an exercise for an elderly population. In addition, once learned it can be practiced at home or in groups, making it a flexible very low cost solution. Hence, it appears that Tai Chi should be recommended to the elderly to improve balance and reduce falls and thereby improve the health and well-being of the elderly. So, reduce falls in the elderly with tai chi. It remains unclear whether Tai Chi is effective for preventing falls in older adults. We undertook this systematic review to evaluate the preventive effect of Tai Chi by updating the latest trial evidence. The Cochrane Library, MEDLINE and EMBASE were searched up to February 2016 to identify randomised trials evaluating Tai Chi for preventing falls in older adults. We evaluated the risk of bias of included trials using the Cochrane Collaboration’s tool. Results were combined using random effects meta-analysis. Number of fallers and rate of falls. 18 trials with 3824 participants were included. 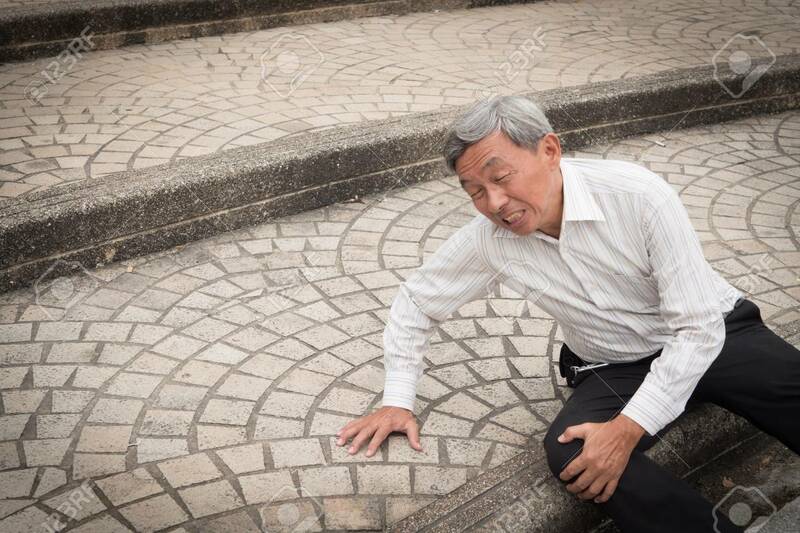 The Tai Chi group was associated with significantly lower chance of falling at least once (risk ratio (RR) 0.80, 95% CI 0.72 to 0.88) and rate of falls (incidence rate ratio (IRR) 0.69, 95% CI 0.60 to 0.80) than the control group. Subgroup analyses suggested that the preventive effect was likely to increase with exercise frequency (number of fallers: p=0.001; rate of falls: p=0.007) and Yang style Tai Chi was likely to be more effective than Sun style Tai Chi (number of fallers: p=0.01; rate of falls: p=0.001). The results might be influenced by publication bias as the funnel plots showed asymmetry. Sensitivity analyses by sample size, risk of bias and comorbidity showed no major influence on the primary results. Tai Chi is effective for preventing falls in older adults. The preventive effect is likely to increase with exercise frequency and Yang style Tai Chi seems to be more effective than Sun style Tai Chi. This study is, to date, the most comprehensive systematic review evaluating Tai Chi for preventing falls in older adults. A number of recently published trials were included, which improved the precision of the estimated effects and enabled us to investigate various influential factors such as Tai Chi style and frequency. Our confidence in the findings is further increased by significant dose–response effect, stable sensitivity analyses and stable analyses by adjusting for publication bias. The findings are likely to be influenced due to the bias in some original trials. The estimated preventive effect of Tai Chi may be overestimated due to publication bias. The process of aging affects every aspect of the physical and cognitive domains. Every system in the body deteriorates including motor function with a decline in strength, flexibility, and balance. Impaired balance is a particular problem as it can lead to falls. In the U.S. one third of people over 65 fall each year and 2.5 million are treated in emergency rooms for injuries produced by falls. About 1% of falls result in deaths making it the leading cause of death due to injury among the elderly. Falls, with or without injury, also carry a heavy quality of life impact. A growing number of older adults fear falling and, as a result, limit their activities and social engagements. This can result in further physical decline, depression, social isolation, and feelings of helplessness. It is obviously important to investigate methods to improve balance and decrease the number of fall in the elderly. Li and colleagues recruited a large group (379) of seniors (> 65 years of age) who were deemed at risk for falls by their primary care physicians. They delivered a tai chi program that was designed to optimize balance for two one-hour sessions per week for 24 weeks. During the 24 weeks of the program 119 participants reported 261 falls. There was a significant reduction in the number of falls over the 6-month course of the program. For the month prior to the training the participants reported 0.5 falls per month while that number fell to 0.13 during the program. By the end of the program the fall rate declined to 0.05 per month. Hence, they found clear evidence that tai chi practice reduces the incidence of falls in an at-risk population of elderly. These are excellent and important findings. It should be kept in mind, however, that the study did not include a control comparison condition. So, the results could be due to subject expectancy (placebo) effects. But, with this caveat, the results are very encouraging. The marked reduction in falls suggests that seniors who practice tai chi will be a substantially less risk of injury from falling. This should not only improve health but also relieve a degree of the fear of falling. This should improve the quality of life and reduce consequent psychological problems. Hence, the practice should be of great benefit to the elderly. In addition, the safe and gentle exercise nature of tai chi practice make it well suited to the elderly. It can also be delivered very inexpensively as it can be taught in large groups and after training practiced at home or in a group without an instructor. Objectives: Few evidence-based fall prevention programs have been evaluated for adoption in clinical settings. This study investigated the dissemination potential of a Tai Ji Quan-based program, previously shown efficacious for reducing risk of falls in older adults, through outpatient clinical settings. Design: A single-group pre-post design in which participants attended a twice weekly Tai Ji Quan training program for 24 weeks. Setting: Communities in Lane County, Oregon. Participants: Referral patients (N = 379) aged 65 and older living independently. Measurements: Using the RE-AIM framework, the primary outcome was the proportion of participating healthcare providers who made referrals. Secondary outcomes were the proportion of referred patients agreeing to participate and enrolling in the program, and measures of program implementation, maintenance, and effectiveness (on measures of falls, balance, gait, physical performance, and balance efficacy). Results: Of the 252 providers invited to participate, 157 made referrals (62% adoption rate). Of 564 patients referred, 379 (67% reach) enrolled in the program, which was successfully implemented in senior/community centers with good fidelity. Of the total number of participants, 283 completed the program (75% retention) and 212 of these attended ≥75% of the total (48) sessions. Participants reported a reduction in falls with an incidence rate of 0.13 falls per person-month and showed significant improvement from baseline in all outcome measures. A 3-month post-intervention follow-up indicated encouraging levels of program maintenance among providers, patients, and community centers. Conclusion: A protocol to refer patients at increased risk of falling to a Tai Ji Quan-based program was successfully implemented among healthcare providers. The evidence-based program appears readily scalable and exportable with potential for substantial clinical and public health impact.